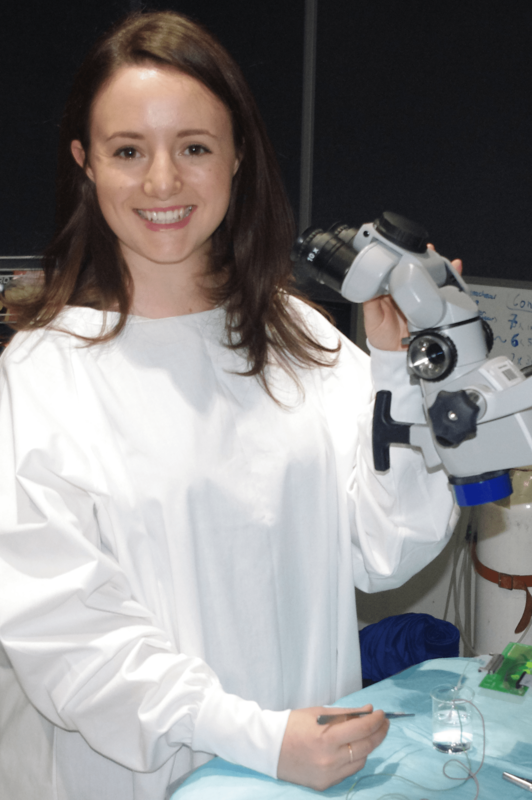 A PhD student at The University of Melbourne has discovered a technique that can improve the resolution of bionic eyes for people who suffer from retinal conditions such age-related macular degeneration and retinitis pigmentosa. “Implants are really limited in how much resolution they can provide. I’m trying to improve that,” says Kerry Halupka, who works with the Bionics Institute. A bionic eye consists of a video camera mounted on glasses, which sends data via a computer chip to electrodes inserted at the back of a person’s eye. The electrodes stimulate the remaining healthy cells in the retina, sending a signal to the brain, which interprets the image. Currently only one version of the implant is available to patients (in the United States and Europe), and for specific diseases only. However, research at The University of Melbourne is hard on its heels. Early retinal implants avoided stimulating a lot of electrodes at once because it resulted in unpredictable effects such as image distortion. Kerry is investigating how to improve the resolution by stimulating many electrodes at once without the unpredictable effects. To do this Kerry built a computer model that can predict the outcome of interactions between electrodes. The model then suggests the best stimulation pattern for the electrodes for improved vision. “It’s like taking a low-definition TV and making it high-definition without actually increasing the number of pixels,” Kerry says. While the research by Kerry and The University of Melbourne and Bionics Institute team still needs to be refined, they hope that human trials might be possible in less than five years.